This first sequel of the new lecture series takes a fresh look at some of the greatest artists in European history, each selected for their innovative and novel way of portraying the events of their time and place, capturing the atmosphere and mood of a particular historical moment. 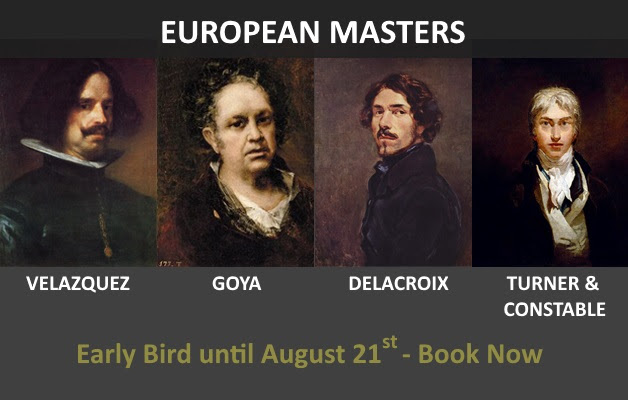 The comprehensive survey will review the life and work of four great European Masters and will provide a broad understanding of the development of Western Art History during a span covering more than 300 years. The first two Spanish masters – Velazquez and Goya – reflect the regal and often tragic events of their times, pivotal periods in European history, though separated by 100 years. The great French artist Delacroix also captured the turbulent years of the Enlightenment and Romantic period, his later paintings setting the foundations for the French Orientalist School, and paving the way for the great Modern masters beginning with Manet and the Impressionists. Art documentaries presented by Tim Marlow will be included to provide captivating in-depth looks into the iconic pieces of the artists reviewed accompanied by additional information and insights.